April sounds bit hectic for me, i have few list of stuffs to do and still am lagging coz of lack of time, sometimes am running like headless chicken. Seriously i want a whole month of rest, i know its not going to happen never ever in my life. But its ok am happy with this busy days. Coming to today's post, this Paneer tikka Kathi rolls goes for this month South vs North Challenge an event owned by Divya Pramil, which is landing towards this incredible Kolkatta famous street food. The theme of this event is to exchange an Indian recipe between two teams. One team is Southern team (food bloggers born and brought in South India) and the another one team is Northern team (food bloggers born and brought in North India).Every first of a month, a blogger from each team will challenge a recipe from their origin and the opposite team have to cook the recipe challenged by the other team. For this month's challenge, Minnie of The Lady 8 Home challenged the Southern team with Paneer tikka kathi rolls, while we the Southern team challenge them with a Kerala platter prepared by Lakshmi Vimala, hope the Northern team will definitely enjoy making this delicious Kerala breakfast dishes. Kathi rolls are wonderful street foods, which can be carried easily and can enjoy them without any mess. They are seriously very filling and am sure if you have them for breakfast you will definitely skip your lunch. Kathi rolls are prepared traditionally with kathi kababs which goes for chicken or mutton chunks but nowadays we can make kathi rolls with varieties of stuffing in it.I enjoyed thoroughly this paneer tikka stuffed kathi rolls for my lunch, trust me its soo filling, even am thinking to skip my evening snacks.Thanks Minnie for this beautiful challenge. Mix all the vegetables together in a bowl, drizzle the juice,sprinkle salt and sugar, mix well. Add in the coriander leaves, mix and keep in fridge. Knead the flour, oil,water and salt together as stiff dough, cover it with damp cloth and keep aside. After half an hour, make medium sized balls from the dough, roll it as small disc, drop in few chopped coriander leaves. Bring the edges together,seal it and dust the dough ball generously. Roll it as thin rotis. Heat the tawa,drop the rolled rotis in the tawa, drizzle oil. Cook on both side until they gets well cooked. Dry roast the spices and grind as bit coarse powder,keep aside. Take the paneer cubes in a bowl, add all the ingredients given under marination, mix well until the paneer cubes gets well coated. Dont disturb for half an hour. Heat oil in a pan, add the grounded powder, fry for few seconds, add the cubed bellpepper, saute for a minute. Add the marinated paneer and cook until nicely coated with spices, let them cook for few minutes, stir gently to avoid sticking to the pan. Add the kasoori methi, diced onions,tomatoes, cook until the tomatoes turns mush and onions turns transcluent. Place a roti, fill it with enough kuchumber. Drop in a tablespoon of paneer tikka. Roll the roti tightly and wrap it with a foil or butter paper. Cut into half or serve whole. You can make the kuchumber, marinated paneer and roti a day before. Just cook both roti and paneer the next day before preparing the rolls. Place the kuchumber in the roti and roll it. You can carry kuchumber, paneer tikka and rotis in your lunch box and prepare your kathi rolls for lunch by yourself. As usual you are the first and you have done it soooo good!! Nice roll dear. Feeling hungry now.. I will definitely try this. Looks so delicious. perfect for kids lunch box..Thanx for sharing,priya!! Superb rolls. Stuffing looks so delicious, yes it is very filling always. Priya, I want to give you a big hug. You are awesome girl. Kudos to you! Kathi roll looks too good! The wraps look very tasty, Priya. Mouthwatering rolls ! Great choice for a filling and delicious lunch. 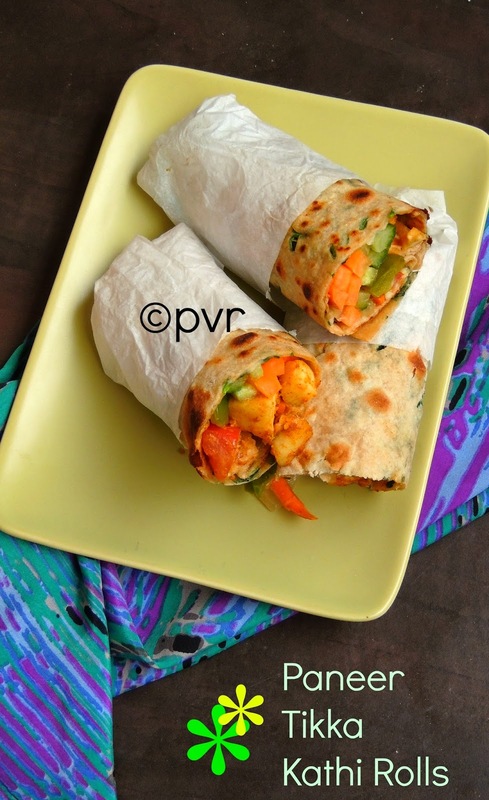 kathi rolls look very filling and tempting..easy lunch box item too! Wow Priya, your rolls look mouthwatering, perfectly made. So yummm!!! 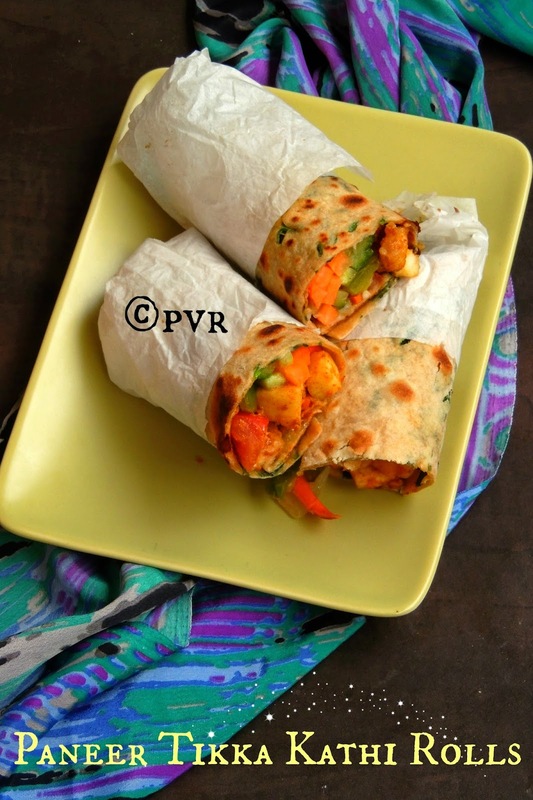 Mouthwatering psneet tikka kathi roll..Pics look so inviting..
Kathi rolls are so versatile and a family favorite for us. This one looks delicious!